Tags can be defined to connect to MQTT devices and software brokers with the built in MQTT Driver Interface The following steps can be used to setup direct communications with MQTT. If the communications for the MQTT driver is not working at all you may need to set the default network adapter priority in the operating system. Start Configure OAS application from the program group Open Automation Software. 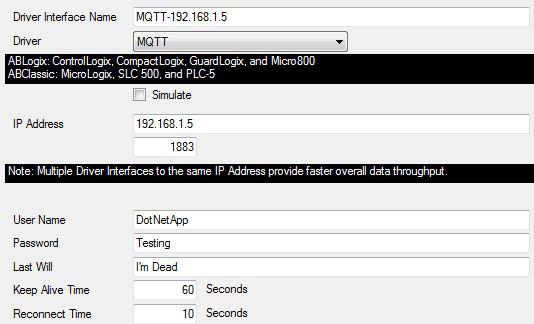 Select Configure-License and verify that MQTT is one of the available Drivers in the lower left of the form. If you do not see the MQTT driver available contact support@openautomationsoftware.com to update your license. Select localhost or the remote service you wish to modify with the Select button to the right of the Network Node list. Note: Optionally select the Live Data Cloud node if you are hosting Allen Bradley data over the Internet with a standard Internet connection. Enter a meaningful Driver Interface Name that you will refer to this physical connection when defining Tags with MQTT Source. Define the properties for the desired physical connection. Note: You may need to Set Default Network Adapter for Driver Interfaces of the operating system. Set the driver to MQTT. Enter the IP Address of the broker. The default port is 1883. Enter the User Name and Password if required. Keep Alive Time – Default is 60 Seconds. Reconnect Time – Default 10 Seconds. If the connection to the broker is lost the Reconnect Time determins how long to wait before attempting to reconnect. Select the Add button in the lower part of the form to add the Driver Interface as an available selection when defining Tags in the next step. Note: If you need to define several Driver Interfaces you can use the CSV Export and CSV Import on the toolbar in the upper right together with Microsoft Excel. Select to Add a Tag. 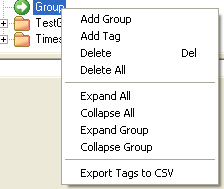 Note: You can also add organizational Groups as many levels deep as you prefer and add tags to groups. To do this first add a Group to the root level, then right click on the Group in the right window to add additional Groups or Tags. Change the Data Source Tag property to MQTT. Select the correct Driver Interface from the Driver Interface pull down list. Select the Quality of Service. Set the Topic Timeout – 0 = Topic will never timeout. Any number greater than 0 will cause the data to be Bad Data Quality if the broker does not publish within the time frame specified. Select to include Timestamp and or Data Quality to the topic. This will publish to the specified topic above OAS/Items Sent/Timestamp and or OAS/ItemsSent/Quality. To define multiple tags use the CSV Export and CSV Import on the toolbar in the upper right together with Microsoft Excel. Note: You can also programmatically define Tags using the free to use OPC Systems component as demonstrated in the Form FormConfigureCSV in the WinForm Example Code application that installs with Open Automation Software in the Program Group Open Automation Software. This component can be used in any .NET application includes Web Services, Windows Services, WPF Applications, and ASP.NET Web Applications. Select the Save button on the toolbar at the top. Create a directory on the local C: drive with the name OPCSystemsDemo. 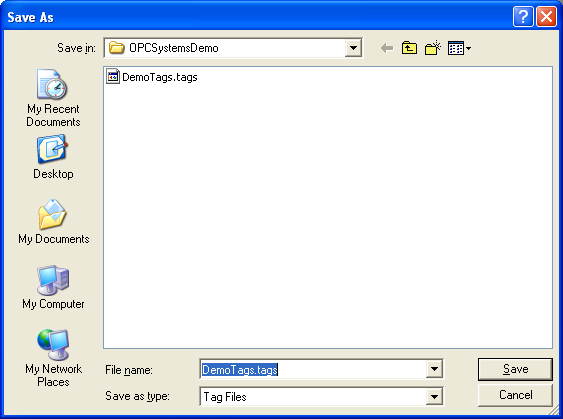 Save the file DemoTags.tags in the directory C:OPCSystemsDemo. Under Configure – Options set the Default Tag Configuration File so when the computer restarts the tag file will automatically be loaded.